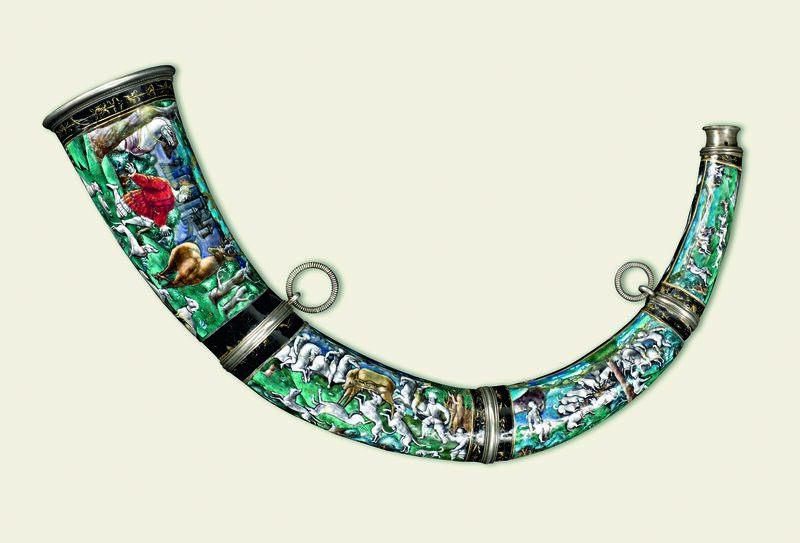 Hunting Horn, Léonard Limousin (c.1505-c.1575/7), 1538. Copper, painted enamel and cow's horn, 30.5 cm length. Private Collection © Private Collection UK. Strawberry Hill was the summer residence of Horace Walpole (1717-97), the politician, antiquarian, novelist, socialite and aesthete. He constructed the house between 1749 and 1790 in an idiosyncratic style intended to evoke medieval Gothic; and he used the interior to display his enormous collection of art, antiquities and curiosities. The house was intended for show: Walpole’s letters recall elaborate parties; he held frequent guided tours; and he published a catalogue of the house’s contents, A Description of the Villa of Horace Walpole (1774). Regrettably, however, Walpole’s descendants dispersed the collection at a sale in 1842. Some items were subsequently obtained by the Walpole collector Wilmarth S. Lewis and now form part of Yale University’s Lewis Walpole Library. But others remain privately owned and have thus been inaccessible to the public for more than a century and a half. Lost Treasures of Strawberry Hill reassembles many of these objects and displays them according to Walpole’s original designs. In the words of the accompanying guide booklet, the exhibit provides ‘a unique opportunity to experience Walpole’s treasures, and Strawberry Hill, as he intended’. Lost Treasures therefore represents a genuinely unprecedented curatorial achievement. Even equipped with the reliable starting point of Walpole’s own catalogues, it must have been a sizeable task to assess the availability of so many long-dispersed objects. The Lewis Walpole Library is naturally a major lender, but I also counted objects from more than two dozen named museums, collections, and stately homes. Still more objects are credited only to anonymous ‘private collections’, suggesting that the curators have persuaded several publicity-shy owners to participate in the event. While only a fraction of Walpole’s complete collection has been reassembled, there is still a wonderful array of items: from eighteenth-century art, ceramics, and miniatures, to classical sculpture and early modern furniture. Some of the objects are remarkable: a sixteenth-century illuminated Venetian psalter; a finely enamelled hunting horn; even a sovereign coin deliberately stretched to depict a deformed Elizabeth I. These original objects are accompanied by subtly-integrated contemporary reproductions: recreated wallpaper and furniture produced using period techniques, and reproduction paintings created through 3D printing. The overall effect can be impressive, especially when one considers that most rooms in the house are ordinarily under-furnished. In particular, the replaced items in the mirrored Gallery and the Tribune – named by Walpole after the Medici treasure room at the Uffizi in Florence – allow one to appreciate a little of the intended aesthetic riches of these spaces. Lighting is also used intelligently, highlighting the geometric relief patterns in the corridor approaching the Gallery, and the delicate ceiling traceries in the Tribune. The marvellous achievements and advantages of Lost Treasures are, however, somewhat offset by some questionable interpretative and presentational decisions. The most obvious problem is a lack of explanatory detail. Aside from an introductory display board at the very beginning, the rooms contain no printed orientation information, and most of the paintings and objects are not identified or otherwise annotated in accompanying captions. Some venues prefer this approach as it supposedly makes exhibitions more immersive and less museum-like; and indeed, I have seen it used to productive effect. At Brighton’s Royal Pavilion, which I visited in September 2018, there is almost no reading matter and instead an audio-guide provides engaging commentary at various levels of detail to suit an individual’s interests. Lost Treasures instead supplies a small booklet which contains introductions to each room and basic identifications of objects. No-one could reasonably begrudge this reliance on a cheaper medium, although it does require the visitor to alternate one’s attention continually from text to room. The real difficulty is that the booklet provides only limited information and on occasion tantalises rather than assists the visitor. The Blue Breakfast Room, for example, contains a painting by Hendrik Danckerts (1625-80) entitled ‘The Presentation of a Pineapple to Charles II (Rose, the Royal Gardener Presenting the First Pineapple Raised in England to Charles II)’ (c.1677). The booklet’s rather evasive annotation tells us merely that ‘this painting may show John Rose (1629-77), Charles II’s gardener, but pineapples were not grown in England until the 1690s’. So are the attribution and dating dubious? Were pineapples imported before being cultivated? Does the painting show an invented scene and for what reasons? Sadly, this is not the only occasion in which the visitor is teased with unanswered questions. Some subjects of portraits are identified, but explanations of their significance or connection with Walpole are not provided consistently. In a few cases even those details are lacking: one room contains fourteen Walpole family portraits, but none of the individuals are named. The booklet also hints that Walpole repeatedly misidentified objects or set out mythical backstories for them. He apparently believed that a seventeenth-century Italian sculpture was a model for Henry VII’s tomb in Westminster Abbey; and that a Peter Lely portrait of an anonymous young man in fact showed the then 40-year-old poet Abraham Cowley. One wonders here about Walpole’s supposed credulity; about his probable taste for confabulation and mischief-making; and, above all, about the wider principles and priorities which underpin eighteenth-century collecting. But instead these cases are merely stated and left as unexplained confusions. There are additional inconsistencies. There are discrepancies between the guide booklet and the rooms themselves – that is to say, the picture hangings do not always correspond to the guidebook layout. Uniquely, the final room has large caption boards, but the text is printed in red on clear glass and is thus very hard to read. Some rooms present objects in museum-style display cases, and while these items do have adjacent annotations, they serve to highlight the absence of such commentaries next to paintings and furniture. Perhaps most strangely, the reproductions receive minimal attention, despite the historical knowledge, artistry and technical skill involved in their production. The Blue Bedchamber contains a double portrait of Walpole’s parents that is, in fact, a highly-convincing 3D-printed copy by the Spanish technology and conservation company Factum Arte. In a rich and thoughtful exhibition in 2014, Sir John Soane’s Museum used Factum Arte objects to reflect on eighteenth- and early nineteenth-century ideas about authenticity and modernity. But Lost Treasures provides no details about the item and I had to ask a guide to explain its absence from the booklet. This principle reaches its apotheosis in the Holbein Chamber, a room designed by Walpole to house copies by George Vertue of various Holbein portrait drawings. The room now contains reproductions of Walpole’s copies, but aside from stating this fact no other information is available, not even the names of the people represented. Overall, the exhibition seems to assume a high level of knowledge among its visitors. One booklet description of a pair of frame mounts reads ‘gouache armorials on paper, Wedgwood plaques and James Tassie intaglios’, a set of remarks which will mean very little to the non-specialist. The cumulative effect of these various presentational decisions and omissions is that Lost Treasures provides a limited sense of how the spaces of Strawberry Hill were used in practice, or about the wider principles of its spectacular collections. Clearly, the house was a particular type of private residence, designed for display and in order to conjure theatrical mystique. What sort of aesthetic and ideological principles were at play here? How did this help to cultivate Gothic sensibility and literature, especially given that Walpole also wrote the widely-read Gothic novel The Castle of Otranto (1764)? How did Walpole’s guests and visitors move through the rooms and how did they react to the experience? Similar questions relate to the individual items. Why did Walpole collect what he did, and was there any sort of scheme in operation? To what extent do his choices reflect personal eccentricity or wider cultural conventions? Systematic attempts to engage with these questions are largely absent, which is a very great pity given the unique opportunity the exhibition affords. Each room has a volunteer guide to orientate visitors and to answer questions. Due to the lack of item captions and introductory display boards – and the fact that most visitors during my trip were not assiduously consulting the booklet – much of the interpretative labour falls to these guides. Fortunately, they are very knowledgeable and respond fully to this challenge. I found out from a guide how much Walpole paid for the Venetian psalter (420 guineas); and that the objects in the Tribune were intended as an homage to Walpole’s mother’s tastes and interests. Another expanded on Walpole’s colourful tale (alluded to in the booklet) that his collection of arms and armour originated in the plunder of a Crusading ancestor. Some of the guides’ comments to other visitors were rich in their implications: for example, that ‘everything [in the collection] is copied from something else’, or that the building itself is a ‘joke’ – that is, intentionally playful and full of surprises. These comments hint at the plagiaristic nature of eighteenth-century culture and also place humour and fun at the heart of Walpole’s purposes. They also lend personality to the collection and make the experience more accessible to visitors without specialist expertise. It is therefore a shame that not all exhibition-goers will be able to benefit from this personal guidance. One guide told me that visitor numbers ranged from 190 to 250 per day, and while that is not an enormous number, it is clearly too many for each person to benefit from a lengthy conversation in every room. In making these various criticisms of Lost Treasures I do not wish to adopt an overly negative tone. The exhibition remains essential viewing, not least because another 176 years may elapse before such a project is again attempted. But it demands prior familiarity with its subject matter, and as such may not be easily comprehended by a visitor unacquainted with Walpole himself or the particularities of eighteenth-century collecting and aesthetics. Happily, there are various way to acquire an introduction. Yale University maintains an excellent Strawberry Hill database, which includes a virtual tour of the property. And a trip to the exhibit itself will be made more enjoyable and accessible if preceded by a brief perusal of Silvia Davoli’s informative full-length guidebook. Lost Treasures of Strawberry Hill: Masterpieces from Horace Walpole’s Collection is at Strawberry Hill House and Gardens from 20 October 2018 to 24 February 2019. The exhibition is accompanied by the publication Lost Treasures of Strawberry Hill: Masterpieces from Horace Walpole’s Collection, by Silvia Davoli (London: Scala, 2018).